My Friday Drop-In class is really fun! Each week I bring in either a photo reference and prepared drawing or a still life set up and we work through the painting, step-by-step, together. This past week we completed our Arches and Geraniums painting. 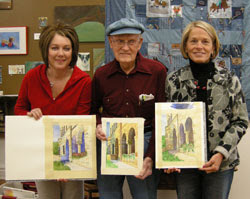 Here are three of my students with their work. I am amazed at the talent that walks into class. I love seeing the student's own styles develop and shine as we all work together. Even though we are doing the same image from the same reference and drawing, each painting is lovely and reflects the personality and style of the one who painted it. Other students bring in their own projects that they are working on and I assist them where they need help. It's a great opportunity to see what others are doing and to enjoy the camaraderie of other painters!